Wes Miller cuts down the net after beating East Tennessee State last February to earn the SoCon regular season title. When Wes Miller became head coach of the Spartans, he was just 29 years old – the youngest head coach in Division I men’s basketball. 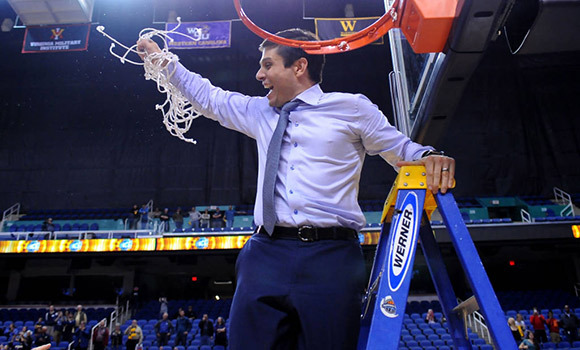 He had just over three years of coaching experience and a few months under his belt as UNCG’s interim head coach. Miller was less experienced than his counterparts, but just as – if not more – tenacious. As interim head coach during the second half of the 2011-12 season, he notched 10 Southern Conference wins and a division title, and was named SoCon Coach of the Year. Now, Miller is entering his seventh season as head coach after a historic run in 2016-17. The Spartans won 25 games last year – the most in program history – and were named regular season SoCon champions. This season, he’s working toward a SoCon Tournament Championship and a trip to the Big Dance in March. But more than that, he’s focused on the development of his players, on and off the court. That’s exactly how Miller approached his own time as a student athlete at UNC Chapel Hill. Miller, who graduated in 2007 with a degree in political science, was compelled to play basketball at UNC in part because he knew that working with Head Coach Roy Williams could prepare him for a successful career in coaching. Because he experienced great mentorship, Miller strives to help his players become outstanding young men. “Our program is about growth and education, in a holistic sense,” he said. For Miller, it’s an exciting time for UNCG Basketball. There’s a lot of momentum – both within the program and across the campus community. Stay up-to-date on all of the Spartan hoops action by visiting uncgspartans.com, and make sure to follow UNCG Athletics on Facebook and Twitter.